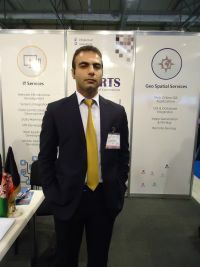 - Today at Baku Expo Centre nine companies are representing Afghanistan, exhibiting a variety of services in the area of information technologies, software development and the sales of computer equipment. The main objective of our participation in Bakutel 2013 is to meet with representatives of the Azerbaijani market, and to explore opportunities for conducting business in your country, as well as the prospects for Azerbaijani companies operating in Afghanistan. In this regard, the exhibition is very impressive, especially the presence of a large number of international companies, major integrators and service providers. We have found it to be a good opportunity to make new contacts, to find customers, to study international experience and to talk about our projects and achievements. As for our company, Afghanistan Reliable Technology Services (ARTS) was founded in 1998 and provides consultation in the field of management and technology. Over the past years, our company has implemented more than 80 projects. Among our clients are ministries and other government bodies of Afghanistan, as well as major companies and international organizations working in Afghanistan.